Women's Floral Leather Wallet Made in Italy, "Florentine Floral"
Since the Middle Ages, the streets surrounding Florence's grand Basilica of Santa Croce have been home to the city's renowned leather industry. Today, the former dormitory of the Basilica even houses a celebrated leather-working school. 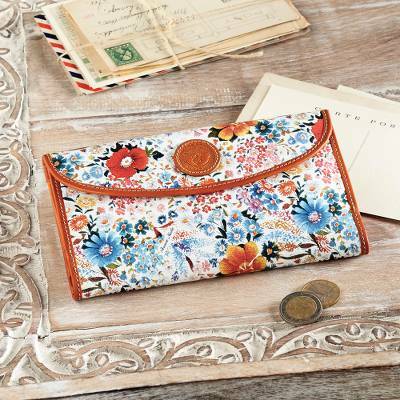 Printed with a cheerful pattern of wildflowers, this beautiful leather wallet has plenty of spaces for credit cards and cash, as well as a clear ID window.